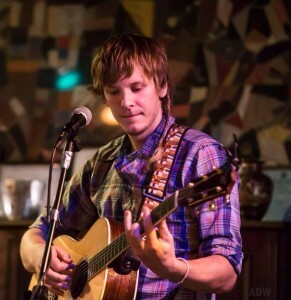 Shane Palko is an independent alternative folk musician and socioenvironmentalist from Pennsylvania, USA. He has officially performed his original music across 5 continents in more than 25 countries including Australia, Austria, Belgium, Belize, Cambodia, Canada, China, Costa Rica, France, Germany, Guatemala, Honduras, Ireland, Mexico, Myanmar, Nicaragua, Panama, Russia, Singapore, South Africa, Singapore, Swaziland, Tanzania, Thailand, Uganda, United States, Vietnam. Palko has released 9 studio albums to date. His music videos are filmed with local partners from various countries in his tour circuits. His most recent release is entitled “Pick Me Up” – which has seven intended meanings. It is his work that exemplifies the most positive perspective yet. The song subject matter ranges from the boyish bliss of an adventure gone wrong in “Captain Dan” to the dark and tentative hopefulness on “Better.” This album is truly his most polished release to date, but still exemplifies the raw, visceral grit of life that connected listeners to his earlier and sadder releases. Shane has recorded and mixed his albums with the likes of Pat Mulrooney, Jon Elfers, and Don Grossinger, who has worked with Joni Mitchell and Crosby, Stills, Nash & Young, The Flaming Lips, Rage Against The Machine, etc. Shane has been invited to preform his original music as a cultural representative to China. He has been asked to partner with Busoga Kingdom on social projects centered around developing musicians. He is just wrote and recorded a yet-unreleased commissioned album for the Tanzanian government. The arts are an excellent median for international cultural and environmental projects. Palko is a Socioenvironmental Specialist and has worked with a number of not-for-profit organizations to strive for positive change in the world. He recently spent nearly three months touring across Africa, Asia and Australia to perform his original music, at the same time working with film and writing to examine and document the importance of place and the functions of music. After that, Shane drove on an overground tour through Central America wherein he performed free concerts in 7 countries over three months. In the current political times, music is one way of showing love across all the beautiful boroughs of this global neighborhood. It is a wonder that Shane Palko has largely shied away from the public spotlight in the United States. Now, with his gathered experiences from seven years of extensive international touring and the release of his 9th studio album, he is ready to begin telling his stories to a wider American public. 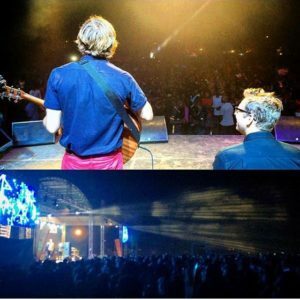 Pictured above, Shane and his brother Ian performing live at the Ekibigiya celebration at Bugembe Stadium in Uganda on December 31, 2016. Shane was formally invited to perform for King of Busoga, William Wilberforce Kadhumbula Gabula Nadiope IV. To see a more complete list of performances, reaching back as far as 2011, refer to “show history.” Thanks for visiting.